It’s an exciting time of year for schools looking to hire the best and educators alike in search of their dream job. 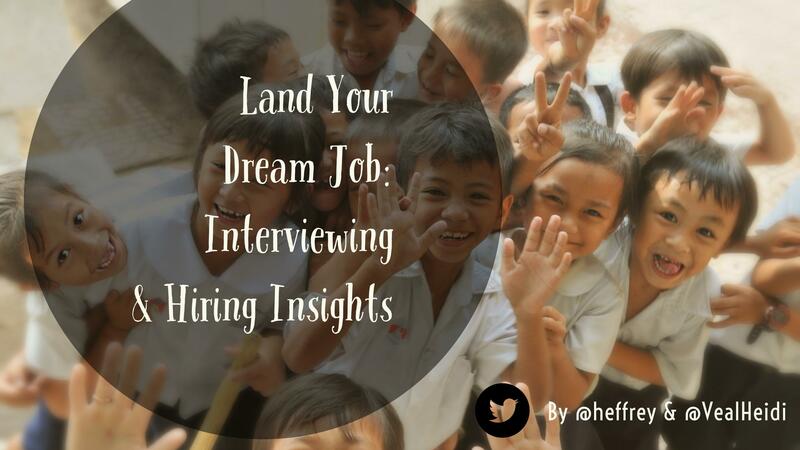 And even though we are heading into the final half of the hiring season, quality candidates and exceptional schools are still in interview mode. Having been both in the hot seat as an applicant and as part of numerous hiring committees, we would like to offer practical advice directly from our own experience for those in the hunt for the best job in the world, Teacher. We want to start by pulling back the curtain and letting you in on a simple, yet important truth about hiring. Every interview represents the committee’s desire to hire only the very best for their students. You might be thinking, duh! But there’s a great deal of depth to this. School leaders understand these wise words by Jim Collins, “People are not your most important asset. The right people are.” Administrators and hiring committees know that their numero uno objective is to hire only the very best, no excuses, and let’s face it, getting The Job at The School you want to be at is competitive. We hope these tips help give you an edge over other candidates and set you apart as The. Best. Candidate. Here goes! The parking lot – your arrival is anticipated so don’t be surprised if a first impression is formed through a window. Dress and carry yourself in a way that communicates yourself as the professional you are. Don’t lose out on the opportunity because an outfit is distracting. Be ready for the committee to ask you, “Is there anything else that you would like to tell us that would help us make our decision?” Have your response to this question ready. Seriously, plan and practice your closing statement! This will be your last opportunity to make a final face-to-face impression with the committee and you want it to be memorable and strong! You want them to have the feeling that they need to offer you the job before you leave the school. Your closing words should punctuate your interview, summarize your core values, and inspire the committee to KNOW You are The Best fit for their school! This post was co-authored by Heidi and Jeff. Love this post! We want these “secrets” to get out to our aspiring teachers and staff. As an administrator, I greatly appreciate you posting this mini-PD session. Kudos. Thank you Dan for your kind feedback. These are all things we wish we had known when we were getting started. Please feel free to share far and wide.